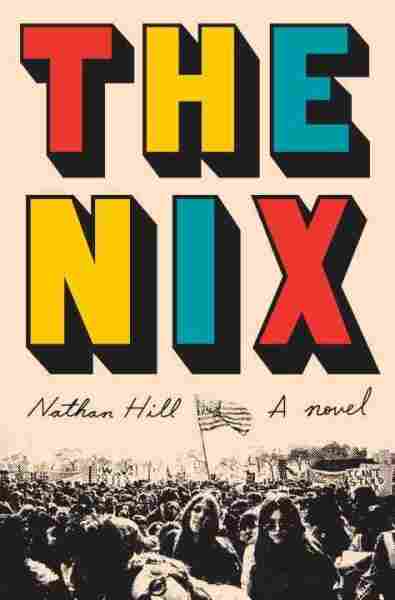 Book Review: 'The Nix,' By Nathan Hill Historical events both real (the 1968 Democratic Convention, Occupy Wall Street) and imagined come to life in this novel. Reviewer Jason Sheehan says it will make you laugh and break your heart. After 10 pages of Nathan Hill's debut novel, The Nix, I flipped to the dust jacket. I wanted to see what the author looked like because I was thinking to myself, Jesus, this guy is gonna be famous. I wanna see what he looks like. At 50 pages in I smiled when my train was delayed — a few extra minutes to read about Samuel Andresen-Anderson, the assistant English professor and gone-nowhere writer who'd failed to live up to a tiny bit of early promise. At around 100 pages, Samuel is in 6th grade — lonely, panicky, a crier at the least little thing — and I know I'm going to miss anything like a reasonable bedtime. At 200, it is stories of Samuel's mother that keeps me turning pages: A teenager in 1968, driven, tightly wound. It is the sketched background of the woman who will abandon Samuel at 11 years old and wreck him in all the million ways that such a thing will wreck a delicate boy; the woman who will float back into his life years later on cable television — briefly notorious for throwing a handful of rocks at a conservative republican presidential candidate in a Chicago park. I fall in love too quickly and too easily. Particularly with books. I am a sucker for anyone with a typewriter and a hot hand with the language. Tell me a story and I am your best friend, your perfect ear, for as long as you can sustain it. The problem? So few can really sustain it. My sluttish history with books is littered with those that I loved and then abandoned when the going got rough — novels dog-eared and loose in the bindings up to page 150 or so, then dropped the minute the passion cooled. The Nix is 620 pages long. My last dog-ear is on page 613. It's nothing important. Just a funny story told by one character to another about the Northern Lights and the burden of expectation. It is lovely in precisely the same way that a thousand of Hill's other paragraphs are lovely — these looping, run-on, wildly digressive pages which, somehow, in their absolute refusal to cling together and act like a book, make the perfect book for our distracted age. Hill's novel is the story of Samuel. Of the boy who became him and the man that he is in 2011, in an Occupy Wall Street America, where he is obsessed with an online videogame called World Of Elfscape and failing at pretty much everything else. But when his vanished mother suddenly reappears on every TV screen in America — this forgotten '60s hippie radical now emerging as a viral sensation with a handful of gravel and no good explanation — he is given a chance to write a book about her. A hatchet-job in which he, the abandoned son, is contractually obligated to savage his own mother in lurid, tell-all fashion. It's a job he takes, of course. Because he's furious. And desperate. And haunted by this woman who left him and his father one day and never came back. He wants answers. This book, he thinks, might be a way to get them. But haunted is the operative word here. Because The Nix is about a lot of things — about politics and online gaming, about the tenuous friendships of adult men and the 1968 Democratic National Convention. It is a vicious, black-hearted and beautiful satire of youth and middle-age, feminine hygiene products, frozen foods and social media. But more than anything, it is a treatise on the ways that the past molds us and breaks us and never lets us go. How it haunts us all. The book's namesake, the Nix itself — in Hill's telling of it — is a Norwegian house spirit. A ghost that finds a person, comes to them in a moment and follows them for life. It is representative of that one instant when life slips sideways and never recovers. A many-faced ghost, equally comfortable being the damaged friend that young Samuel couldn't save, the girl he loved beyond all reason, the mother who left him, the career that escaped him. It is a perfect organizing motif for a book about the small mistakes that become a life's great tragedies, and secrets held too close and for too long. It broke my heart, this book. Time after time. It made me laugh just as often. I loved it on the first page as powerfully as I did on the last, and I think I was right, right from the start. Because Nathan Hill? He's gonna be famous. This is just the start. Jason Sheehan is an ex-chef, a former restaurant critic and the current food editor of Philadelphia magazine. But when no one is looking, he spends his time writing books about spaceships, aliens, giant robots and ray guns. Tales From the Radiation Age is his latest book.